The MMMCoffret from my city ! First of all, I would like to take this time to wish you all Happy Holidays ! I have had the best year because of all your support and kind words, your encouragement and the people that stop me in stores to tell me that they love my blog. My dream is coming true because of you ! Enough with the cheesyness, this month, I had the opportunity of getting the inside look of the new Subscription Box from Me, Myself and Montreal, the MMMCoffret. First and foremost, what is a subscription box you ask ? It is a system that allows you to pay a certain fee a month and to receive a beautiful little box full of goodies at your doorstep every month. Americans really perfected this art with the crazy number of subscription boxes they offer, but it is very nice to see a box coming from my city, Montreal. What I adore about the MMMCoffret is the fact that the goodies such as jewelry, accessories, coupons and etc. are all from Montreal designers, which is an amazing way of discovering hidden artists in our city. Here is a sneak peak of the November box called Casse-Noisette. 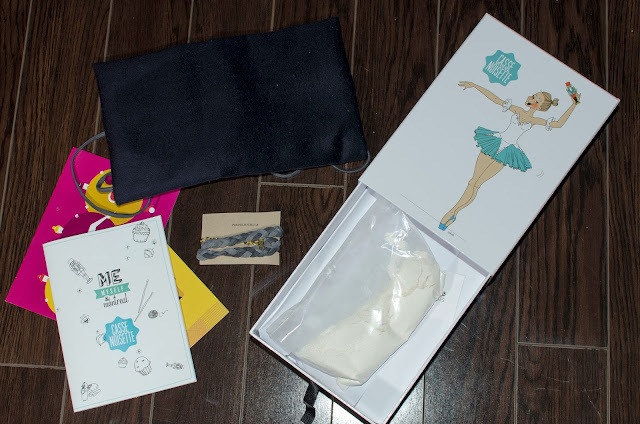 Goodies from Atelier B., Pas de Chichi, Rose Madeleine, La Maison tricotée, Fernando Volken Togni Chicquero, Boutique Belle&Rebelle, Grands Ballets Canadiens. I surely used the Grands Ballets Canadiens coupon to continue the Christmas tradition I have with my aunts and cousins, watching the Ballet Casse-Noisette during Christmas week. Here is the link where you can join the MMMCoffret subscription for 27$CAN a month.